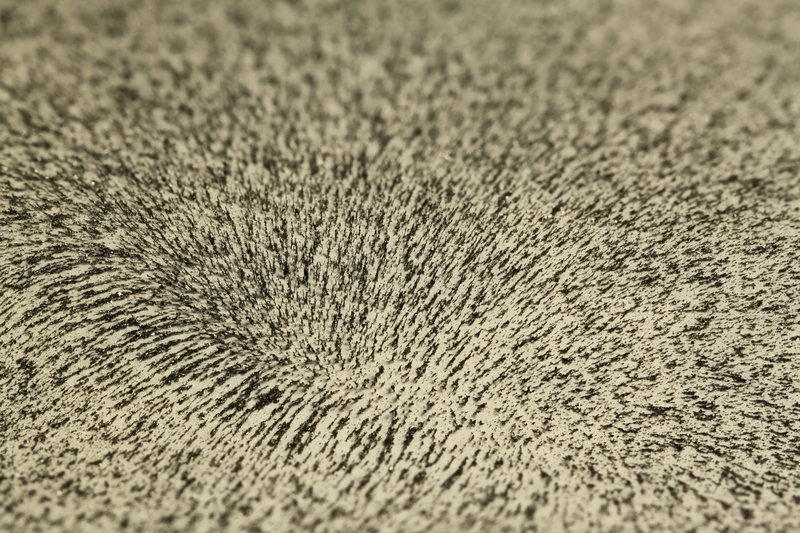 I was fooling around with iron filings on paper over a magnet this afternoon, and got intrigued by what the pattern would look like if I got real close. This area struck me as visually interesting. 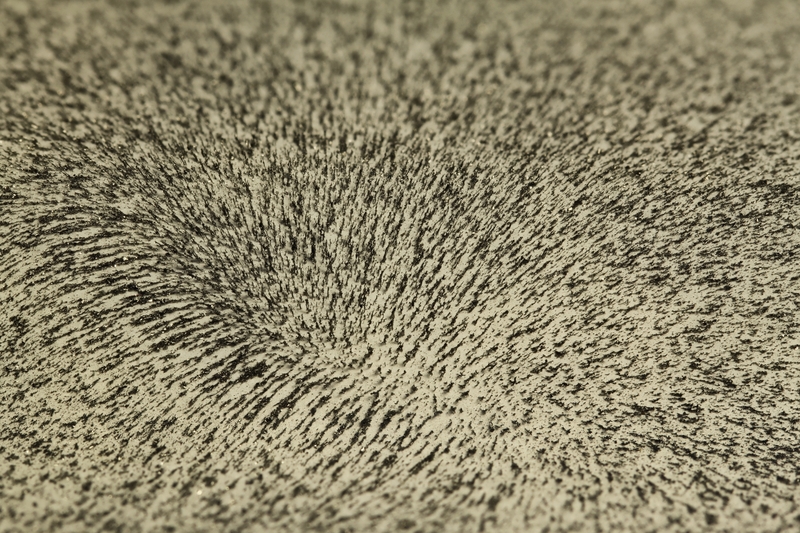 It covers the transition where the field around the end of the magnet gets both strong enough and sufficiently perpendicular to the paper that it pops the strings of filings up off the paper and stands them on end. Reminds me a bit of those apocalyptic ruined-forest shots you see in fantasy films. Crossed-eye stereo, this cropped field of view about 2 mm wide. Shot with Canon T1i and Canon 100mm f/2.8 at about 1:1.8, 1/12 second at f/8 with desk lamp illumination. 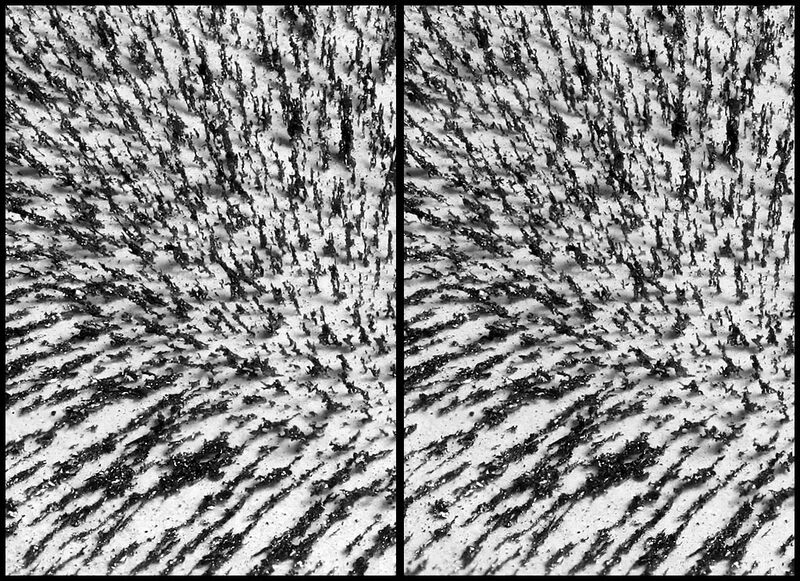 This is true stereo, two short stacks of about 10 images each. This is true stereo, two short stacks of about 10 images each. 4 cm of lateral shift at a distance of 30 cm, so I guess about 7.5 degrees. I did a trial run at f/32 without stacking, testing lateral shifts of 1 cm, 2 cm, and so on. 4 cm looked good, so then I shot two stacks with that. The stacks were quick-and-dirty manual things, tweaking the focus ring by hand while watching live view on the back of the camera. Final assembly in StereoPhoto Maker, of course. It does alignment and keystone removal automatically. As usual a wonderful post. I had more trouble than usual viewing this one. I accidentally started to put my hand in front of my nose but then remembered it is crossed eye stereo. So I brought my hands in from the outside and it really helped and improved the viewing too. Instead of the stereo with two copies on either side it was just the stereo view with my hands on the sides. Really helped the viewing experience. Great idea! Maybe I knew that trick at one time, but surely I did not remember it. Tried it just now, and I agree it does much improve the viewing experience. Hi Rik, Very interesting picture! There is quite a bit of window violation. That is one reason why it is more difficult for some viewers. I suspect 4cm shift is quite a lot. I have converted the crossview picture to a .mpo image and put it on my 3D monitor. There you can see directly the window violation. In a cross view image you see this less likely. If I adjust it with a shift of 42 pixels, the window violation goes away and makes it easier to see. For a true 3D HD monitor, I have to small picture width. I love 3D images. Hence my many recordings with flying insects in 3D. True 3D images were also on my program as soon as my new setup is finished. Do you sometimes have a link to larger images, preferably separately left and right. I would like to see it on my 3D HD 1920x1080 monitor. I use StereoPhoto Maker to, so this is no problem for optimization. Errors or optimization you see it naturally better on a high resolution 3D monitor. There is quite a bit of window violation. That is one reason why it is more difficult for some viewers. ... If I adjust it with a shift of 42 pixels, the window violation goes away and makes it easier to see. I assume that "window violation" means that parts of the image appear to be in front of the screen and therefore cause conflicts where they hit the edge of the frame. In this scene, the conflicts are especially evident at the bottom of the frame. For this scene I specifically adjusted the shift so as to put zero disparity at the center of the image, so the scene is half in back and half in front of the screen. The reason was to balance framing discrepancies at the top and bottom of the frame. When the entire image is behind the screen, there are no window violations but there is a large disparity and thus a large framing discrepancy in the background, at top of frame. I did not like to lose so much interesting 3D structure in that area, and I decided that accepting some window violation was a better tradeoff. I have just now repeated the exercise and find that I make the same choice. In a cross view image you see this less likely. That could be, but it does not explain my choice in this case because I selected the shift using a parallel viewer also. Do you sometimes have a link to larger images, preferably separately left and right. Yes Rik, I mount the near points to the stereo window into the options. This makes the difference here. No courrante viewers will have a harder time with your used option. Their eyes need more time to adapt to the stereo image. As a result, they can not so long watch 3D images without headache. I personally do not bother, even cross-view images I see immediately. For many viewers this will be a problem. This remains a disputes between 3D viewers. And the viewing method also make a difference. Problem here are the limited possibilities. You are practically limited to cross-view or parallel-view for forum or internet. .mpo files are supported nowhere. Thanks Rik for the links. I have made a 100% crop for the HD monitor as .mpo file with the option " mount near points to the stereo window". For me, the stereo image is much quieter. Now I see that you selected shift of 4cm is well chosen. It is a beautiful picture on my Asus 3D active monitor. Very nice! It works very well but it may be difficult for untrained stereo viewers. Mainly because it does not have an easily detectable big shape for the eyes to catch and fuse. And it may be nicer to place the depth behind the window.